Trying to get the most out of your time at each conference can be a challenge. Growing your network is a key goal most attendees hope to accomplish but managing all those business cards can become a hassle. Using the Jujama app makes networking easier, allowing the user to exchange business cards electronically, making networking a breeze and eliminating the chance of losing the card in the future. The app also allows you to make multiple versions of your own business cards, allowing you to decide which card is best to use depending on the situation. Within the app, each individual’s electronic business card is automatically created using the basic information already entered in the app including their name, title, company, address, as well as their email. Additional information can be added to further customize each e-business card. Sharing business cards is now even easier. With one simple click, business cards can be exchanged directly through the app or via email. Multiple business cards with varying information can be created, making it easy to send the appropriate card depending on the new contact. Each individual card is created with its own QR code. Quickly exchange business cards with fellow attendees by scanning the others QR code directly through the app using your camera, automatically importing their business card into the My Collection tab. Collecting business cards is just as easy. Under the My Collection tab, users will be able to find all the cards they had gathered during the conference, making post networking simple and easy. The app allows for the user to then effortlessly move their new connections from My Collection into their personal address book. Happen to run into someone not using the Jujama app yet? Collect their business card, scan a picture of their card, and import it directly into the app. This feature helps you keep track of all business cards in the same place without fear of misplacing any valuable contact information. 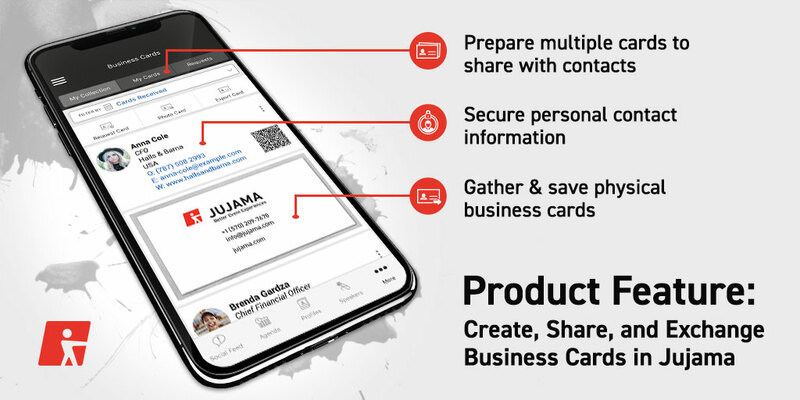 The Jujama app doesn’t just allow you to connect with those you’ve met in person, users can also request business cards from others inside of the app as well as send their own directly to another user, eliminating the middle man. Forget to ask for a business card or didn’t get the chance to meet someone you were hoping to connect with? Jujama has you covered. This feature is for those looking to grow their network in a way that is painless yet effective. Attendees and coordinators alike will find this feature easy to use and incredibly useful in managing their new contacts without the hassle of handling countless physical business cards that can be easily misplaced. What value does the feature add? The e-business card feature eliminates the fear of running out of printed business cards before the end of an event, allows for easy tracking and sharing of collected business cards, makes importing contact information of networks to your address book hassle free, features the creation of multiple personal business cards to use at your own discretion and more. Keep track of all physical and electronic business cards in one place. Let Jujama help you make the most of your networking events.